Search Engine Optimization (SEO) is the process used to increase the visibility and ease by which customers and consumers will find your website via a search engine’s “natural” or un-paid (“organic”) search. SEO is the process used to make web pages more useful for internet searchers. 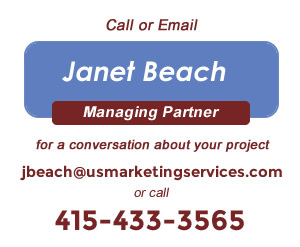 US Marketing Services can help you develop or adapt content and copy based on what your customers want to know about your company and what you want to highlight. By adjusting the content of your site or blog posts to better align with SEO goals you can achieve better organic search results. We work with SEO experts to help our clients bridge the gap between the content, the analytics, and the action. Thanks for sending this new version of the site. Very nicely done; our webpage now is found first and looks so professional. We are very pleased and grateful for all the good ideas and efforts you made for us. The website looks amazing! I am no longer embarrassed by that old 2-page spread. Patients and doctors will now find out what they want to know about us more readily. This was truly a team effort and I appreciate all the hard work that all of you put into helping us “show off” our clinical section (which has undergone its own “facelift” over the past several years). Thank you for your vision, expertise and foresight.